In 2002 Christopher Lynch wrote a book called Chicago’s Midway Airport: The First Seventy-Five Years. 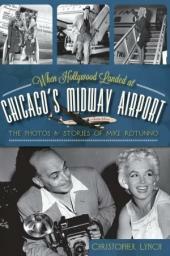 Ten years later he published another book called When Hollywood Landed at Chicago’s Midway Airport. The second book is largely the story of Mike Rotunno who was the Midway Airport photographer during the 1920s through the 1960s. Because Midway was THE airport of the Chicago area during this time, it was the scene of arrivals and departures of many celebrities from the world of Hollywood. When Mr. Rotunno was called on assignment to take photographs, he often brought his daughters, Mimi and Judy with him. Not only did he take photos of the stars, but he also introduced them to his daughters. As a result, the girls grew up thinking that Hollywood movie stars such as Roy Rogers, Hopalong Cassidy, Dean Martin and Jerry Lewis were their playmates. Eventually, after a long tenure at Midway Airport, Mr. Rotunno moved on to a similar assignment at O’Hare in the early 1960s. Somewhere, though, in the course of his career, part of his collection of negatives was lost. The family did not know if they were misplaced, left behind or discarded. One day, out of the blue, Mr. Lynch received a phone call from a family who lived in the home in Berwyn where the Rotunnos had resided years ago. It seems that a box of negatives from the years 1933 to 1938 had been discovered, tucked away in the rafters of the garage. Mr. Lynch contacted the sisters who were delighted to hear of the find. Mimi traveled to the Chicago area and met with the family who graciously turned over the negatives. They were still intact, able to be developed–and hadn’t been seen in over 80 years. As a result, through the generosity of the Rotunno Family Collection, we are able to bring you a few of the photos. They are but 3 of 1200 negatives that were found in the box. And what interesting finds they are! I am grateful to Christopher Lynch and the Rotunno girls for their willingness to share the story. Mike Rotunno was well aware of the fame of his photographic subjects and gave his daughters the marvelous opportunity to meet so many famous people. And, because of their cooperation with Christopher Lynch, a family was able to track them down to return a box full of wonderful photos and memories. One of the most iconic photos of early Schaumburg Township is this view of a new bridge built over Salt Creek on East Schaumburg Road near today’s Spring Valley Nature Sanctuary. 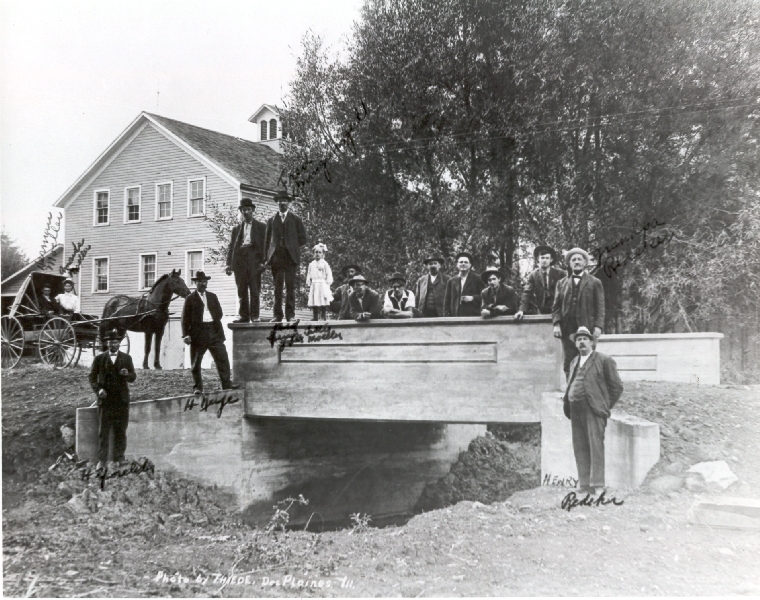 With so many people in the photo and the relatively new Wilkening Creamery in the background, the photo provides an interesting display of local residents and their excitement over a new bridge that had to have made their lives much easier. 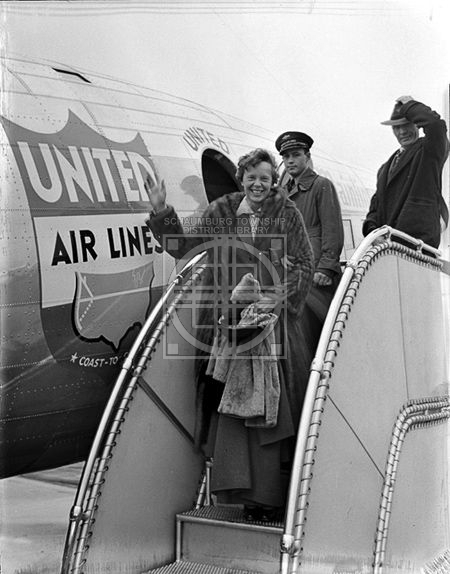 What is barely noticed in the photo is the photographer’s name in the lower portion of the picture–Thiede of Des Plaines. Knowing that our library has a few photos by him, most of which are outside photos, I thought it might be a good idea to contact the Des Plaines History Center to see if they had his archive of photos. 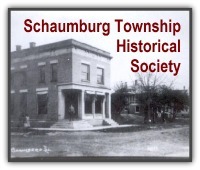 Acquiring other Schaumburg Township photos for our collection would make for neat, unique items in our Digital Archive. Unfortunately, in exchanging emails with them, I discovered that they have photos and postcards of their own taken by Thiede but do not have his collection. In further discussion though, they mentioned that, interestingly enough, Mr. William Thiede is actually buried in the Immanuel United Church of Christ cemetery on Old Church Road in Streamwood. Having just obtained their records on microfilm, that got me started in a whole new direction. It seems that William Julius Thiede was born in Germany and moved to Hanover Township with his parents in 1880. By 1891 he had married Ida (Mundhenke) Thiede in the above mentioned church. They either lived nearby or had a real affinity for the church because their daughter, Alpha, was baptized in the same church in early 1892. The 1900 census lists the family in Elk Grove Township where William was employed as a teacher for Cook County School District No. 63 and their only child is Clarence, born in 1894. (Alpha died in 1899.) 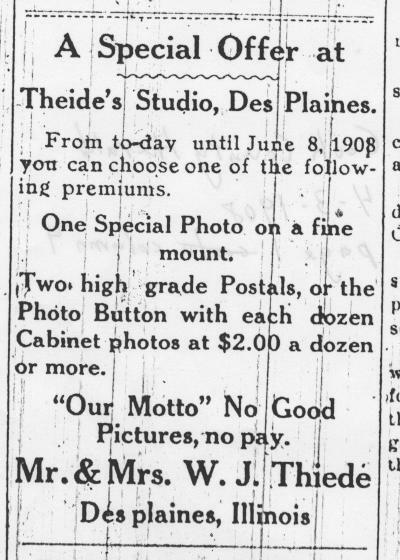 Shortly after this they moved to Des Plaines and William established his first photo gallery on Ellinwood Street. Later he purchased a tailor shop at 686 Lee Street and converted it to a photographic studio. In 1910 the personal information in the census is the same except they were now living in Maine Township and William was an insurance agent. According to information at the Des Plaines History Museum, he served as a representative for Prudential Insurance Company from 1909 until 1927. Shortly after the 1910 census, another child, Evangeline, was born to them in 1911. Unfortunately, she died in September of 1920. The same year William sold his studio. One can imagine he didn’t have much heart for photography work after his daughter’s death. A stroke in 1925 caused him to retire from active life and he passed away at the age of 60 from the long term effects. His wife, son and daughter-in-law were the only survivors. Clarence died in 1963 leaving only his mother and wife. Obituaries for the two ladies have not been found. Because we know William and his daughter Evangeline are buried in the nearby cemetery, it is difficult to suppose that his wife is not also. I have walked the rows and did not see a stone for the name Thiede. It would be interesting to know the end of the story if anyone can supply it. It is true that Mr. Thiede and his family may not have lived in Schaumburg Township but he most definitely left his mark. A picture is, indeed, worth a thousand words. [After reading this posting, Shari at the Des Plaines History Center did a little more digging. She discovered that, on July 12, 1962, William, Alpha and Evangeline were all reinterred at the Town of Maine cemetery. 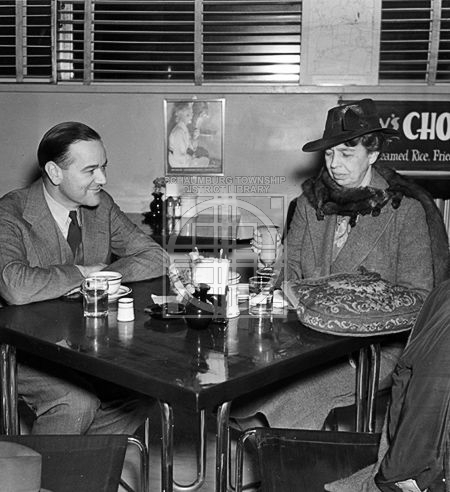 This was one year before Clarence died in July 1963 and two years before Ida died in May 1964. Rose was also buried there later.